Rent WMNF Studios! Need a professional studio space with state of the art recording and broadcasting capabilities? WMNF studio facilities and ISDN lines are available for public use. Contact us for rental rates and availability, telephone interviews, and live call-in ability. We also have reporters available for field work and tape syncs, and able to transfer digital recordings. Neumann, Studio Projects, Shure, Audio Technica, Avlex mics – in any configuration. 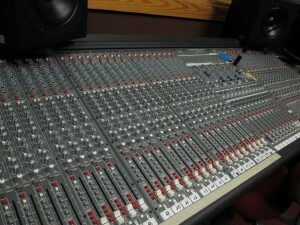 24-channel board, with 8-channel multitrack capability. Multiple voiceover and interview studios available. Audio can be delivered on CD, external drive, digital file upload.